(Oregon Coast) â€“ One wacky little surprise that possibly awaits you on the Oregon coast is the wild sound of â€œtalking barnacles.â€� More correctly, it's a faint grinding noise they make; and if you encounter a lot of them doing it, it may sound like they're all chattering among themselves. Oregon coast tide pools are always full of trippy new discoveries, but this will likely be a memorable one. It's barely audible, but it's described as a grinding or clicking noise. Mostly made by what are called acorn barnacles, they can be made by volcano barnacles as well. It doesn't take much to disturb them, either. Acorn barnacles will clam up and dart into their shells when even just a shadow passes over them. So it's possible even just moving around a tide pool area freaks them out and causes them to get nervous. Part of the interest here is that they reach out and grab stuff with that feathery appendage, then plopping it in the barnacle's mouth. You can see the acorn barnacles at the Seaside Aquarium, although they are underwater and not poking out of a tide pool â€“ so you won't be able to hear them at the facility. Even so, it's more common to be able to hear that odd grinding noise while they're still under the thin layer of sea water you find at a tide pool. Those in the air will likely be closed up. At the aquarium, Chandler said they are fed brine shrimp, although they normally eat plankton in the wild. â€œWe don't really have a lot of plankton, but brine shrimp is like a plankton,â€� Chandler said. 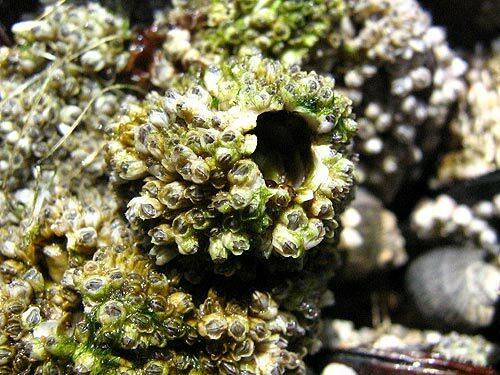 The acorn barnacle's scientific name is Balanus glandula, and they're extremely common to the Oregon coast and indeed the entire U.S. and Canadian shorelines. They are crustaceans, which makes them more closely related to the crab and or lobster. Inside the two shells lives a tiny arthropod (meaning jointed-legged), existing at an odd angle there where the forehead of the creature is what is sticking to the inner shell. That feathery part is essentially the legs of the barnacle. The Seaside Aquarium is on the Prom in Seaside, Oregon. 503-738-6211. More Oregon Coast Science. More barnacles and Oregon coast tide pools below. Also see the Complete Guide to all Oregon coast tide pools. Above: photo by Tiffany Boothe of Seaside Aquarium - a barnacle growing on a whale. Above: photo by Terry Morse - the "tsunami dock" in Newport in 2012 showed up with barnacles on it.